Aditunes – Make your duck sing! A while ago I wrote a plugin/script for Adium. It facilitates sharing the current song in iTunes with your chat partner. It is/was quite popular with over 16.000 downloads and an average score of 4.2 out of 5. Unfortunately I didn’t have the time to support the script anymore, that’s why “Adium” kicked it off the extras site. Below is a link where you can still download the script. I’m hoping someone likes the idea and maybe improve it. All the code is public and open for anyone to alter. PS. Please don’t ask me for technical support, as I said I don’t have time for it anymore. There is a read me included with instructions and tips if you run into trouble. Inspired by the TrackURL script by jrigby, special thanks to Erik Koldenhof. I've used a large portion of "Save Album Art to Album Folder" for iTunes, written by Doug Adam (thanks!). As it is distributed under the GPL, I'm, as far as I understand, obligated to do so as well. Thanks Wesley Underwood, Adam Betts and Laura Natcher for the Adium Ducky artwork. The HTML layout is inspired by a template from http://www.templatesbox.com . I would like to thank Tony Yazbeck; my beta tester and text corrector! A very big thanks to all the Adium developers! Get a copy of the GNU General Public License by writing to the Free Software Foundation, Inc., 51 Franklin Street, Fifth Floor, Boston, MA 02110-1301, USA. -- check if iTunes is running, if so send result, else send message "iTunes not running"
set iTunesRunning to (name of processes) contains "iTunes"
return "I'm sorry, iTunes is not running." return "Listen to my iTunes: " & "\"" & TrackTitle & "\"" & " by " & "\"" & TrackArtist & "\"" & ""
set trackList to stringToList for trackURL from "/"
-- Create an image (jpg or png) from iTunes' Artwork data, read above for more information. do shell script "cp " & (POSIX path of AdiTunesfolder) & "images/album.png " & (POSIX path of AdiTunesfolder) & "album.png"
You can use the code to create any other script. 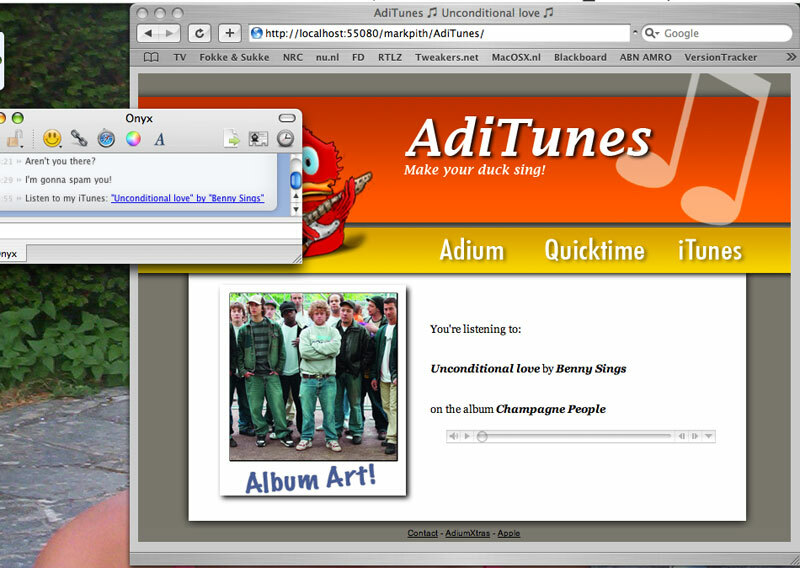 For example, have iTunes create a (locally hosted) website with the current song, everytime a new song starts. I have been a longtime aditunes user and love this simple script that makes my Adium so much more enjoyable… Recently I had to reinstall OS X on my macbook and was wondering if you could supply a link to this script seeing as http://www.adiumxtras.com/index.php?a=xtras&xtra_id=1394 is down. I did see that you no longer support this script but I hope this doesnt count. BTW- I’ve been reading about your script, i’ve read on multiple places that AdiTunes is not Tiger supported, i would like to say that i’ve been using it in tiger seamlessly since juneish, if you dont mind a bit of chatting; what part of the code isnt supported by tiger? Hi, the link seems to work for me. I think the comments about Tiger were about older versions of AdiTunes. The 1.0 version should be working with Tiger. Let me know if you keep having problems with the link. I used to have this extra in adium but I had to reinstall adium on my computer a few month ago and lost all of my extras, I would really like to have this one back, it’s a great plugin!! Do you have another link? No problem, I’ll store it somewhere and post the link. Please, pleaseeee I love your plugin and I promised a friend she could have it. She probably bought a macbook just for it! I’m the friend of the guy above… it’s true! Hope you’ll enjoy the plugin! I have been stupid I admit it. just wanted to say thanks for an awesome adium xtra!! @Idetrorce: I’m not sure with what you’re not agreeing. legitimate items you can download with them. If not, then there should be an option to begin downloading again. The Tor software program is contained in the Vidalia program.